I just finished a really beautiful chair that is on display at WOOD IX, A Furniture Show at the Escondido Arts Partnership at the corner of Juniper and Grand. There is over $130,000 worth of great furniture on display!! Stop by when you have time. We have special prices on some amazing pieces this winter. Each piece is custom designed and crafted to your specifications. You will get to participate in the process by selecting wood, finish and fabrics. Stop by the shop and watch the progress of your piece as it comes to life. This is quality workmanship at its finest! 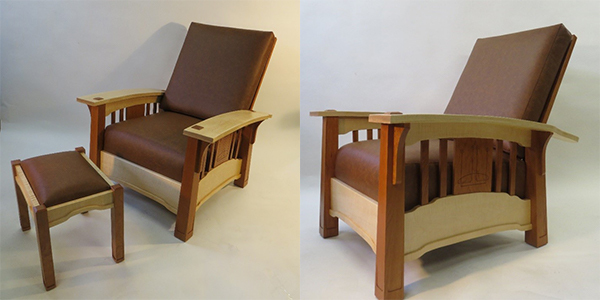 This Chair is currently at the Escondido Arts Partnership in the WOOD A Furniture Show IX and you can see it on display and sit in it. The Gallery is at 262 E Grand Ave, Escondido, CA92025. This striking contemporary Arts & Crafts design complements our Mission Contemporary Dresser & Bed. The eight slats in the sides and the tapered legs lend the piece a striking stance. We installed butterfly keys in the top. The small drawer is side hung with half blind dovetails. 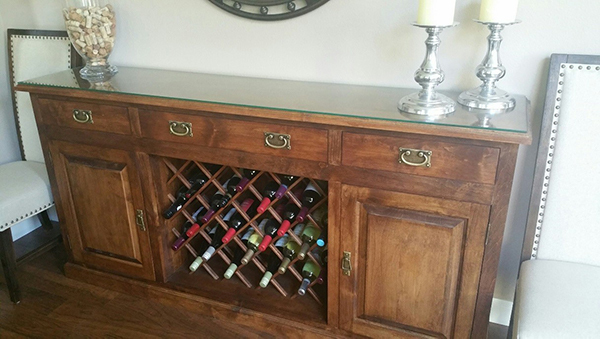 This buffet is designed for the Wine Lover and makes a perfect piece to assist with a buffet style dinner. 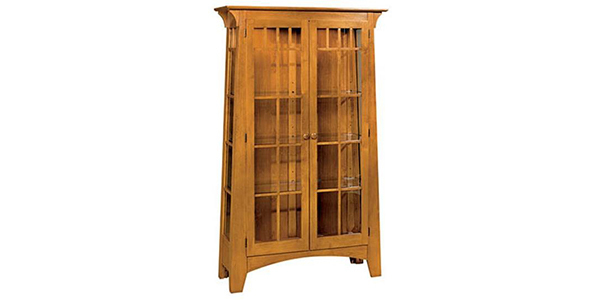 Solid raised panel doors, and the center storage section holds 35 bottles of your special wine. There are also three drawers with hand cut dovetails lined with green or red felt along with solid brass hardware. The top is 1 1/8” thick with inlaid cherry butterfly keys in the glue lines for a stunning contrast. We also can have an optional shatter proof glass top made to protect for hot dishes as shown in the picture..